St Nicolas Church, South Street, in Portslade's 'Old Village', is one of the oldest in the City of Brighton & Hove, and has the distinction of being the only church that has been consistently used for worship throughout its 850 year history. St Nicolas Church, can be found by turning north at the Southern Cross traffic lights on the Old Shoreham Road (A270) and via Locks Hill to South Street. St Nicolas has a car park at the Parish Centre next to the Church. There is a bus stop opposite St Nicolas Church served by Brighton & Hove Buses routes 1 and 1A . These routes connect Portslade and Mile Oak with all parts of the City, across to Whitehawk at the eastern end of the route. St Nicolas Church, Portslade is the second oldest church in the City and has the distinction of being the only church that has been consistently used for worship throughout its 850 year history. 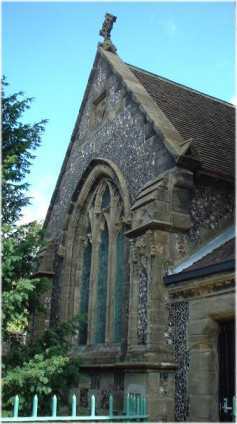 At various times throughout history since 1523, St Helen’s was held by the Vicar of Portslade as one of two livings. From 1864 to 1955 the two parishes were united by Order of Council. In the 1870's, the children from both Portslade and Hangleton were educated at the Brakenbury School (St Nicolas Church School) in Locks Hill which was built for the poor of the united parishes of Portslade and Hangleton. In the1950's a massive house building programme was undertaken in Hangleton and once again St Helen Church became the Parish Church of Hangleton and was no longer united with St Nicolas Portslade in a single parish. 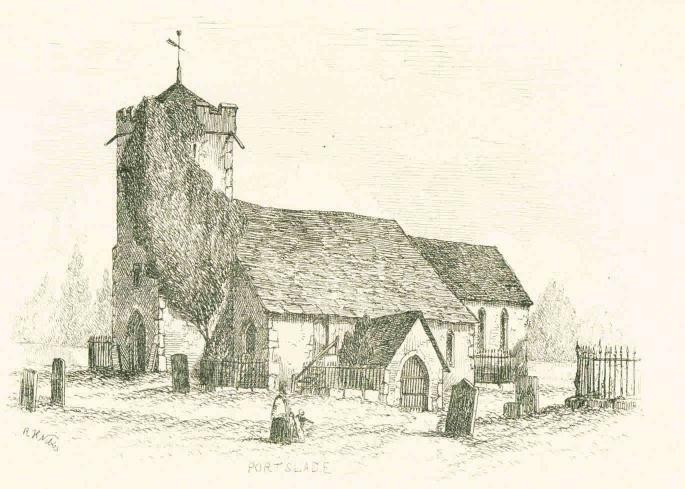 About 900 years ago, the people of Portslade decided to build their own church. It was a little Norman church situated on a hill on the eastern side of the Old Village, overlooking the Channel. It became a landmark to sailors and was appropriately dedicated to St Nicolas, Patron Saint of Sailors. 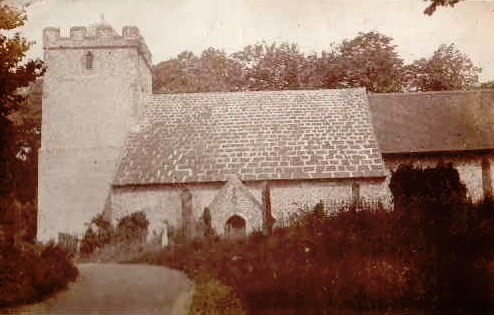 It was built of rubble with stone dressing and the church now consists of a nave of three bays with north and south aisles, a chancel with modern north vestry, and western tower. At the west end of the north aisle is the Brakenbury Chapel which was built in 1869, and under the tower is the baptistery. There is also a south porch of uncertain date. 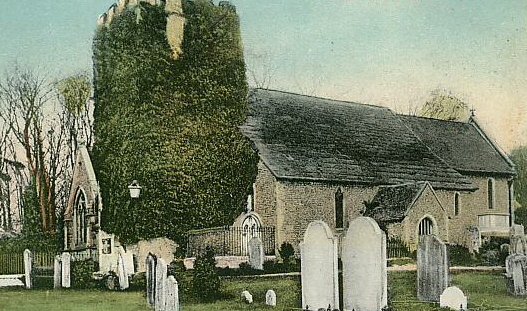 The church is on ground, that slopes from west to east, and the chancel is not in line with the nave. By standing at the west end of the nave one notices that the chancel is inclined towards the south. It may have been the intentional that the chancel was built out of line so as to represent Our Lord's head leaning to one side when he was crucified, hence the term "Weeping Chancel". Situated in the south wall of the sanctuary is the sedilia and piscina, which are 13th century. The seats rise from west to east, below arch hood moulding which terminates at either end in mask-stops of crude design. The seats in the sedilia were designed for the use of the Celebrant and his Assistants at Mass and the piscina is a stone dish with basin used for the ablutions at Mass, a ceremony when the Priest washes his hands, after the offertory (very necessary centuries ago when the faithful offered goods or poultry instead of money) and the used water is drained from the piscina to the ground. There are two fine lancet windows at the east end, good examples of 13th Century architecture. The Calendar of Charter Rolls of 1312, now held in London, shows that the Lord of the Manor of Portslade, John de Warenne, Earl of Surrey, was granted a charter by King Edward II to hold a Fair at Portslade annually on the 6th December, The Feast Day of Saint Nicolas. 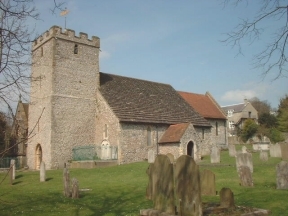 Early records show that in the 12th century, St Nicolas Church was paying a tithe of 40s to the Priory of St Pancras at Lewes, the first Clunic House to be built in England. The petition below, from the Priory to St Peters, Rome requested that tithes should also be collected in the 13th century . The Calendar of Papal Registers "Lateran Regista" records a letter received in St Peters, Rome on the 7th September 1401 from John Oke the Prior of St Pancras. :-"dated in the chapter-house of Lewes 26 Nov. 1400, which recapitaulate and confirm the grant by his predecessors as pittance to the sub-prior and convent of the following: all the fruits etc. 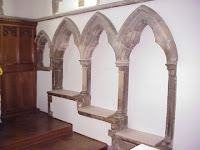 of the churches-appropriate to the monastery by papal authority, portions for vicarages being alone excepted" the papal letter goes on to list the tithes required from 20 churches in the south of England, Portslade is named and was required to pay 20 shillings a year to the Priory. In 1847 this ancient "Doom Painting" was found when the south nave wall was being repaired, the walls were lime-washed in the same year and the paintings were lost. The fresco extended for 22 feet and from the abaci towards the roof it was 12 feet. Doom Paintings depict:- "The Day of Judgement"
See below the 1847 article entitled:- "Ancient Mural Painting in Portslade Church" for more information. Historians in recent years have coined the phrase "Lewes Group", which refers to wall paintings in the churches of Clayton, Coombes, Hardham, Westmeston and Plumpton. It is believed a workshop or school of Clunic monks at St.Pancras Priory was responsible for these paintings. The use of the term "Lewes Group" cannot be positively proved by historians, as the Priory and its paintings were destroyed in the dissolution of the monasteries in the reign of Henry VIII. Clayton is 6 miles to the north and Coombes, is 6 miles to the west of Portslade. A traveller in medieval times walking from Clayton would have passed through Portslade via the Roman Road "Port's Road" to reach Coombes. During St Nicolas' association with the Priory, the Parish would have been subjected to many visits by the monks for assessment and collection of tithes. St Nicolas' Last Judgement Painting has a similar overall composition and the same posture of "Christ Enthroned", surrounded by the Apostles and Virgin Mary as in the Clayton paintings. At St Nicolas there was also evidence of an earlier wall painting under the "Last Judgement" fresco, another painting that could be distinguished on the south wall was the "Adoration of the Magi". Unfortunately we do not know how representative the above drawing was to the actual St. Nicolas "Doom Paintings", the fresco's were not subjected to detailed scientific investigation before they were lime washed over in 1847, to establish if their style and age was contemporary to the "Lewes Group". 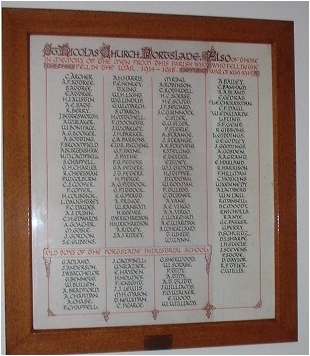 See "Hove & Portslade in the Past" website for a detailed list of names on the above Roll of Honour Memorial. Vicars, Curates and Deacons of St Nicolas Church, Portslade. 1526 Henry Honeby, & Rector of St Helen Hangleton, 1523. 1584 Henry Englisshe, & Rector of Aldrington, 1584. 1598 John Postlethwait A.B. & Rector of St Julian Kingston Buci, Shoreham by Sea, 1605. 1607 John Bridge A.M. & Rector of St Helen Hangleton, 1613. 1638 Nathaniel Hancock A.M. & Rector of St Michael & All Angels Southwick, 1643. 1669 John Temple, & Rector of St Helen Hangleton, 1660. Gilbert Henry Langdon. Curate, 1830. J. W. Peers. Assistant Curate 1841. John Willoughby Hodgson, Curate 1852-1858. 1859 Frederick G.Holbrooke, & Rector of St Helen & Priest in Charge of St Andrew Portslade. 1864 St Andrew Church, Portslade by Sea, is built under the direction of the Revd Holbrooke who becomes Priest in Charge of this new District Church. 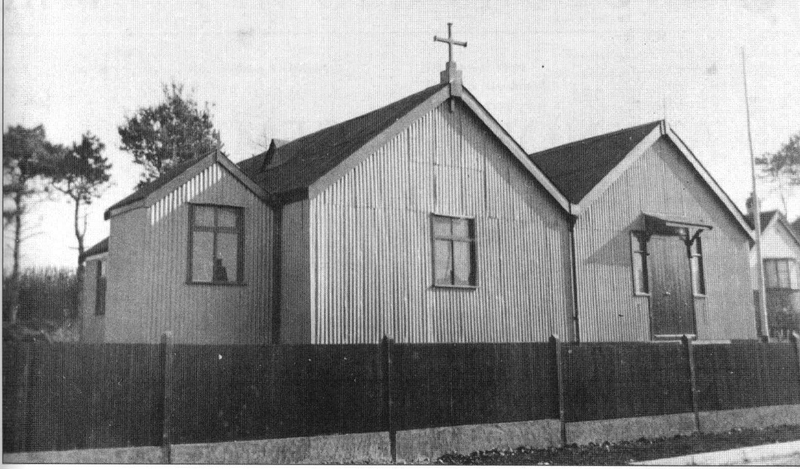 1936 The Parish of St Nicolas , erect a temporary "Tin Church" at Mile Oak to cope with the increase in population, this new church is called the Church of the Good Shepherd, Mile Oak, the “Tin Church” was kindly donated to the Parish by The Church of the Good Shepherd, Dyke Road, Brighton. 1955 St Helen Hangleton becomes a separate Parish and no longer united with St Nicolas Portslade, St Nicolas Church's Curate Peter Bide is appointed Rector of St Helens. 1981 Richard H.Rushforth M.A. & Priest in Charge of St Andrew's. 1987 St Nicolas Church united with St Andrew's Church to form The Parish of St Nicolas & St Andrew. 1987 Richard H. Rushforth M.A., Vicar of the Parish of St Nicolas & St Andrew Portslade. 2013 St Nicolas Church and St Andrew Church united with The Good Shepherd Mile Oak to form the new Parish of Portslade St Nicolas and St Andrew and Mile Oak The Good Shepherd. 2013-17 Andrew J. Perry, Vicar of the Parish of Portslade & Mile Oak. Peter Pannett, Distinctive Deacon, 2013-2014. Andrew Birks, Ordained Deacon at St Nicolas on 3rd December 2016 and ordained Priest at St Bartholomew's Brighton on 10th June 2017. Currently serving as Assistant Curate. 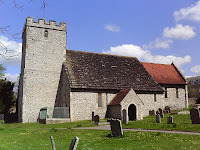 THE Church of Portslade is classed by Rickman, among upwards of seventy others in this county, as being "of the early English style, having little admixture of other styles." 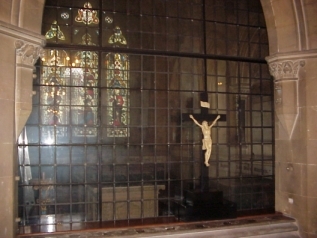 The chancel does, in fact, present a very pure and elegant specimen of this style in its two simple lancet windows, at the east end, the effect of which is united by a small circular window of six points being placed above them, and in its three lancet windows in the north and south walls. Beneath a string course of a bold undercut moulding, running immediately below these windows, there is, on the south side, a piscina under a trefoil arch with small side columns, one having a capital of foliage, and three sedilia of unequal heights under trefoil-headed arches, nearly level, the outer corbels of which represent heads of priests. The opening from the chancel into the nave is formed by a fine pointed arch, near which have been discovered some paintings, and an imperfect inscription in old characters: on the south side of the nave is a narrow side aisle, separated from the nave by two short massive circular pillars, two feet six inches in diameter, with Norman capitals under square abaci. Three pointed arches without any mouldings rest on these columns, supported at either end by the chancel and tower walls. It having become necessary to repair the western arch, it was ascertained that these arches consisted of coarse flint-work with merely an edging of stone, and were evidently of much later date than the columns, from the character of which it may be fairly inferred that the original arches were round, and the nave built in Norman times. The principal fresco, which is the subject of this notice, and is represented in the lithograph from a sketch by Miss Gorring, occupies the wall above these columns, from them up to the plate on which the roof rests. It extends twenty-two feet in length and twelve feet. seven inches from the abaci upwards. Beneath the thin coating of plaster on which this painting has been executed, there appear in some parts the traces. of an earlier painting, a circumstance not unusual, and of which a remarkable instance has been lately noticed at Beckley church, Oxon. (Archaeol. Journ., No.15, 256.) At Portslade this older fresco exhibits only a wall of masonry, and tall, narrow windows, with diamond quarries, the colours used being simply light red and ochre; whereas in the later painting there occur also the varieties of black, deep yellow, white, and dark red. During the repairs of the summer of 1847 the painting became visible, and though much mutilated, and the colours but faint, enough remains to show that the subject is the Day of Judgement. The central compartment is occupied by the Saviour Judge, placed within an arched space, diapered with rudely-shaped fleurs de lis. There is a dignified expression in this figure, the head of which is in-closed by a nimbus, coextensive with which appears an equal limbed cross, on which some of. the spines of the crown of thorns appear . The open uplifted hands present the stigmata, with blood flowing from them. The lower part of the figure seems to have been concealed by a semicircular arch, perhaps the orb or the rainbow. On his right hand are seen angels summoning the dead with trumpets and other instruments, and m the upper part are various Saints engaged in mediation, with the Virgin, having a supplicatory expression, crowned with a jewelled diadem, nearest the judge. Above her appears St. Joseph clasping a long parti-coloured staff. In the lower part appears the resurrection of the just, represented by several figures, in various attitudes, rising from the grave and looking towards the central figure. On the left hand of the judge there are also several Saints with nimbi, in the upper portion. The palm-bearing Saint in front is seen to present some person for acceptance, possibly some benefactor to the church, while some rejected sinners are seen forced downwards, and at the extreme left there remains the upper half of a large figure of Satan, with two dark upraised wings. In the lower part is the place of torment, among the flames of which are seen. the heads of sinners curiously arranged in two parallel files of six each. Above these are the fragments of another bat-like wing, and two dark oval spaces, perhaps the apertures of some vessel in which the condemned are placed, or they may possibly represent great eyes, which may indicate that they belonged to the usual representation of the jaws of hell, the sinners being inclosed within the mouth of a gigantic devil. This figure, however, is not now traceable further. On the northern wall, opposite, the first indications or painting had been observed several years ago, and indeed the whole wall was thus ornamented, but the fragments remaining, consisting principally of a quadruped, some waves, and some heads, are too imperfect for description. Here, again, were traces of paintings of two different eras, the earlier one having been broken into by the insertion of a Decorated window. The wall also of the southern aisle was anciently covered with painting, the remains of which were found much mutilated. One portion represented the Adoration of the Magi, in black and ochre colours. It should be mentioned that, near the angels sounding the trumpets in the large fresco, there are depicted in dark colour, now nearly black, two cinquefoil heraldic roses, which would lead to the supposition of the House of Lancaster being in the ascendant at the time of their painting. Another guide to the probable date is seen also on the north wall, at the highest eastern corner, a shield of arms (two feet two inches long by one foot nine inches wide) supported by angels. The shield is divided quarterly, the first and fourth being now at least quite blank, while the second and third bear on a dark field, either sable or gules, a lion rampant argent. These may have been the arms of Fitzalan, * Earls of Arundel, and the Chequy of Warenne or the Fret of Maltravers may have occupied the blank spaces, if ever filled. It may be presumed, from a Decorated window having been intruded upon the painting, and from these other indications, that the walls of Portslade Church were thus ornamented in the course of the fourteenth or more probably in the fifteenth century. Note:- Unfortunately these ancient mural paintings were lime-washed over in the same year as the above report to The Sussex Archaeological Collection, and are no longer visible today. Brakenbury Chapel on the north west corner of St Nicolas Church, Portslade. 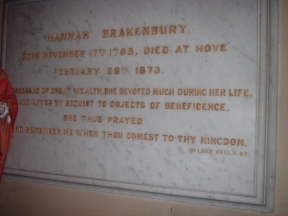 *Note*, Although Hannah was baptised with the surname Brackenbury, she appears to have dropped the "c" from her surname while living in Hove. She sanctioned the new spelling of "Brakenbury" which is displayed in the Brakenbury Chapel and on the wall of the old St Nicolas School (now Portslade County Infants School) which she opened in 1872. Early in the 1800’s Mr James B. Brackenbury moved to Manchester to practise as a solicitor, he was the legal advisor of the Lancashire and Yorkshire Railway Company at its formation, and he made a large fortune in the early days of the railways. Miss Brackenbury resided with her brother in Manchester until October 1844, when, in consequence of his illness, they moved to Brighton, where he died in the same month. His only daughter having also died, Miss Brackenbury succeeded to his great wealth. She continued to reside in Brighton (Portslade), devoting her life and fortune to the promotion of charitable institutions, and generally in the most unostentatious manner. Some of her benefactions were, however, of such a character, that they could not remain unknown. The fabric of Balliol College, Oxford, was falling into decay, she donated £20,000 for the full rebuilding costs of the south side of the quadrangle, facing Broad Street, over the entrance gate is a tower, which is called Brackenbury’s Tower. In Brighton Miss Brackenbury also distributed her gifts bountifully and often anonymously. In the spring of last year she erected a large free school at the picturesque village of Portslade, near Brighton, for the accommodation of 250 children, and she took part in the celebration of its opening. Altogether, during the last ten years Miss Brackenbury gave to charities upwards of £100,000. The remains of her two brothers and niece lie in a vault in Portslade churchyard, over which Miss Brackenbury erected a mortuary chapel. There her own remains will be interred on Friday morning." The Funeral at Portslade Church. The funeral procession, which consisted of five mourning coaches, each drawn by four horses and the private carriage of the deceased, left Adelaide Crescent,Hove at 11 o’clock, arriving at Portslade shortly after 12. Among the mourners were the Very Rev. Dr Robert Scott, the Dean of Rochester and the Rev. Professor Jowett, Master of Balliol College, Oxford. The church was filled by the villagers and those from adjacent parishes; and the burial service was impressively read by the Rev. F.G. Holbrooke, Vicar of Portslade; the psalms included in the service being chanted by the boys of the choir, Mr Machonochie presiding at the organ. possessed of great wealth, she devoted much during her life, and after by bequest to objects of beneficence. Hannah Brakenbury donated the land and financed the building of the Brakenbury School in Portslade, later to be renamed St Nicolas School. now called the Brackenbury Primary School. The inscription on the School's west wall reads: These Schools were erected by Hannah Brakenbury for the benefit of the Poor of the united parishes of Portslade and Hangleton A.D. 1872. In 1967 a new St Nicolas C of E Junior School was built on land adjoining the old school. 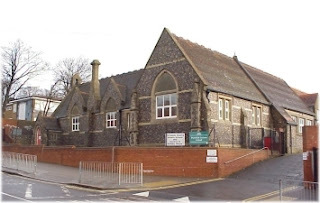 The old Brakenbury-St Nicolas School was taken over by by the former Portslade Infants School which changed its status to a primary school in 2013 and is now known as the Brackenbury Primary School. 7 Asylums, 4 schools, 3 orphanages, various benevolent societies, SPCK, Church Missionary Society, London Missionary Society and British & Foreign Bible Society. Locally in the Brighton area she left £1000 to Sussex County Hospital; £500 to Brighton & Hove Dispensary; £500 to Lying-in Institution; £500 to Asylum for Female Orphans; £300 to Asylum for the Blind; £200 to Deaf and Dumb Institution; £50 to St Mary’s Hospital, Queens Square; £50 to the Mission House of Hope. *(£1 in 1873 has the spending power of £58 today, '1873 value of the pound' from a House of Commons Research Paper 99/20'). Brackenbury Coat of Arms at Balliol College, Oxford. At Balliol College (Oxford University) Hannah is remembered as a major benefactor of the College. Hannah Brackenbury’s coats of arms appear in several places on the buildings she paid for. Balliol College was established in the first place by philanthropy, and has been sustained by Benefactors ever since. “The Bidding Prayer” recites, in the chronological order of their deaths, the names of the major Benefactors since the earliest days, Hannah Brackenbury is listed in this prayer. The Prayer is traditionally read out by the Master in Chapel on special occasions, especially at the service before the annual Gaudy, and on the feast of St Catherine of Alexandria, the College’s Patron Saint. In the College life at Balliol, Hannah is also remembered in the form of the Brackenbury Society. This debating & dining society met regularly from 1890 to 1955, when it combined with (Matthew) Arnold Society, and today it is known as The Arnold and Brackenbury Society. In September 2005, Durham University built two new residences for post-graduate students, one of which was named Brackenbury House, in memory of one of the University’s earliest philanthropists. Hannah Brackenbury endowed a series of professorships at the University in Mathematics, Medicine and Science.